Google’s company policy requires that each office reflect some of the local color of the city around it: Google Zurich has ski gondolas, Google Pittsburgh has steel mill photos, and so on. That policy results in designs that sometimes border on twee (see: Google London's gratuitous Union Jacks), but sometimes, it ends up being brilliant in a campy sort of way. 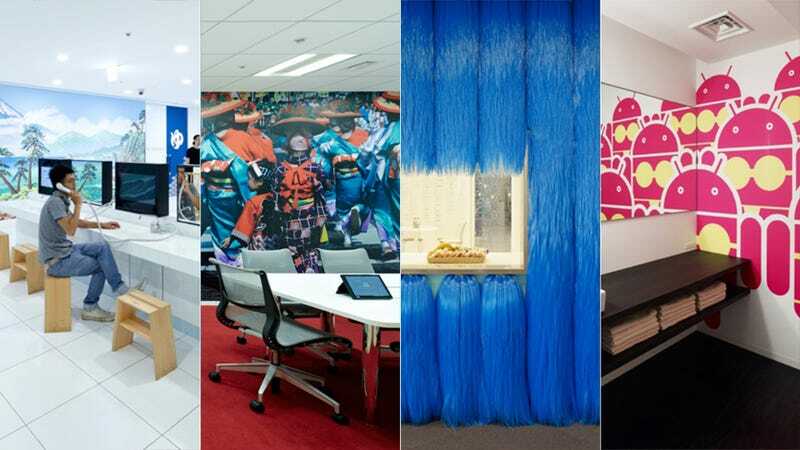 In the case of the company's new Tokyo offices, it’s the latter. Google requested an even more vivid evocation of Japanese culture. Looking to communicate the Japanese context without resorting to cliché, KDA incorporated surprising elements such as a full-scale yatai (mobile food stall) and a digital koi pond that greets people at one of the entrances–responding to hidden sensors, carp projected onto the floor move towards those who enter the space as if expecting to be fed.